Google Trends lets you see search trends for any keyword or topic, in any location and date range that you want. Thing #1: Find the most popular keywords so that when you name or describe your product, you can use the same terms your customers are using. As we've found time and time again, people are much more likely to respond and buy when you use the same terminology they do, whether in ads, blog posts, or in the name of what you're selling. That makes sense, right? Because they're faster to recognize that you have exactly what they need if you're using the same words they are. Or when you put out new content, you can use your knowledge of relative keyword popularity to do it with an eye toward SEO. Or use it to get a better idea of what keywords to bid on in AdWords. Scroll down and you'll also see related queries: a list of other phrases people search for, ranked by popularity. These are additional keywords you should consider, and which you can then plug back in at the top to compare against your original terms to compare over time. Thing #2: See which locations have the most interest. You can break out the above info by countries, states, cities or metro areas. So sticking with the same example, you can see interest by state just under the chart at the top. Scroll down from there and you'll see separate breakouts for each of the three sales keywords we're comparing, and from there you can zero-in on cities or metro areas. Thing #3: Understand when people are looking for what you offer and plan accordingly. Which hours of the day, days of the week, months of the year are people most interested? Expanding our date range out a bit, we can see that if you have a sales software product, you should plan your marketing to hit harder in Jan/Feb, when interest increases as businesses get new budgets for the year. But don't expect much interest on Sundays, as you can see by zooming in on a shorter time period. Fun fact: did you know that nail salons get a lot busier around Christmas, springtime and July 4th, while hair salons have much more even interest year-round? For new brick-and-mortar businesses, that info is priceless -- it can enable them to staff accordingly or run promotions outside of those peak times to even out their cash flow. 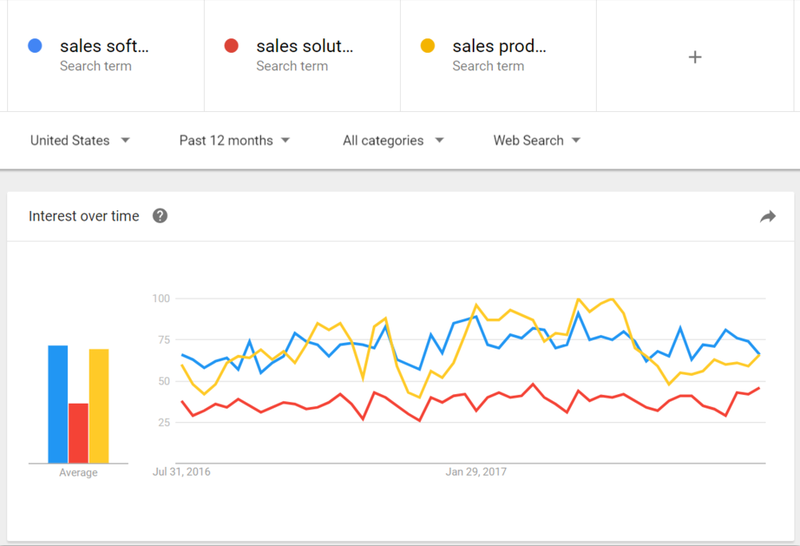 Those are just a few ways you can quickly pull useful data from Google Trends, and there are many more if you think creatively. Give it a shot!